The FEA or the Finite Element Analysis has been the domain of PhDs, high tech engineers and a wide array of specialist for many decades. Scientist and technicians have spent countless hours huddling over the mainframe servers and writing codes and simulations and re-writing them again and again which requires a huge amount of time dedicated by powerful servers. Until the 1990s, FEA analysis and application was mainly limited to the automotive, aeronautical, nuclear and defence industries. It was considered the ‘black magic’ form of traditional CAD/CAM which was used in design and manufacturing, due to its elusiveness. But with the passage of time and advancement in technologies which have increased the software capabilities, bought faster computers in the mainstream and massive improvement in the graphic user interface has enabled the Finite Element Analysis services to reach out to a much wider audience. The various tools of Finite Element Analysis are highly accessible and easier to learn and can be operated on any computer device to run highly computing intensive simulations. 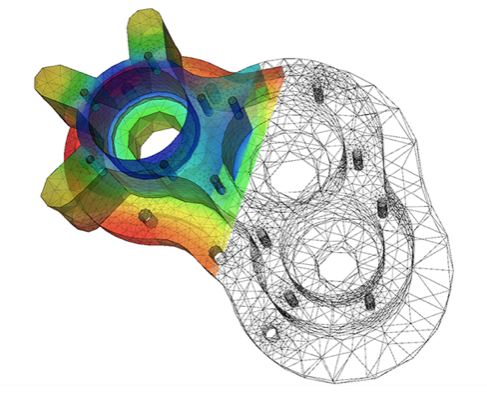 Finite Element Analysis or the FEA can be referred to as a computer-based process which is utilised for modelling of highly complex systems and products. These computer-generated simulations take place in a virtual environment. The simulations are intended towards problem-solving or find for solutions of complex performance issues. The knowledge of Finite Element Analysis highly essential and can be very useful for any graduate in engineering or science. Finite Element Analysis is an application to engineering and material science, wherein it is used to compute the behavioural attributes and strength of different materials under different conditions regarding vibration, deflection and strength. Finite Element Analysis can be utilised towards investigating both small-scale and large-scale behaviour of different types of material. The Finite Element Analysis software is widely available and can be operated on any computer device. Prior to using Finite Element Analysis, testing was done by developing prototypes and testing them under different conditions. Often, key parameters were missed during the prototype stage, as a result of this rendering the test to be futile. Using Finite Element Analysis, the design can create, maintain and load a fixed ‘recipe’ for all parameters of a certain material. Using this recipe, the designers can model all forms of physical stresses on individual parts, including the ones which might have been overlooked during the initial stage of design. Using Finite Element Analysis increases the material accuracy while designing a product and showcases how different forms of physical stress might have an impact on the design. Using Finite Element Analysis enables a designer to model for the entire system rather than doing in separate bits and pieces. The mainstream introduction of the Finite Element Analysis has been a boon to product development as it makes it possible to analyse that how different forms of stresses on one piece of material can affect another piece of material which is connected to it. Offers Better Insight into various Critical Design Parameters. The ability of Finite Element Analysis to model the interior and the exterior of any design is one of the biggest advantages of using Finite Element Analysis. Ithelps in determining how different critical factors can affect the internal and external structure and the structure as a whole. It can also help indetermining causes of failures which can occur and where can they occur. Using Finite Element Analysis simulators helps in eliminating creating physical prototypes which can be a time to consume and expensive process. Further, badly made prototypes can lead to faulty results and deem the simulation results as futile. Finite Element Analysis helps in creating virtual prototypes and simulations which can conduct numerous simulations simultaneously and investigate various material parameters etc. Virtual prototypes and simulations are faster, economical and can provide results within hours instead of days or even week. Businesses which are proficient in their use of Finite Element Analysis software tend to be much more productive and can create an additional stream of revenue for the business by offering 3d scanning services. Also, companies using Finite Element Analysis software can help in producing good quality products with shorter design cycles, lesser wastage of time and material. Guest article written by: Kiran Hurkadli is the director of Zeal CAD. He is offering CAD drafting Service in Australia for the last some years. He has earned good success in the CAD drafting industry for his unique and custom designs for his clients.